The methyl ester of CA-074 is a very potent and selective irreversible cell permeable inhibitor for cathepsin B. The biologically active inhibitor is released after hydrolysis of the ester by intracellular esterases. Therefore, CA-074 Me is working only in vivo and whole cell experiments, but not in in vitro experiments. 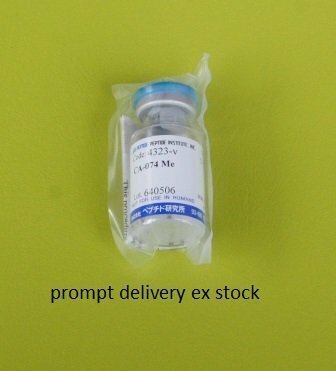 CA-074 Me is distributed through Peptide Institute, Inc. under the license of Taisho Pharmaceutical Co., Ltd.